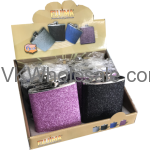 Buy wholesale beverage holders for your c-store inventory. Stock up convenience store inventory with these beverage holders and start making profit easily. These wholesale beverage holders are very cheap and good to keep cans and bottles cold. Buy beverage holders in bulk now. Our special items includes wholesale chicago bulls beverage holders, wholesale sox beverage holders, wholesale chicago cubs beverage holders, wholesale packers beverage holders. These can holders are original! Minimum quantity for "Assorted Flask for Liquor with Studs 7oz 8PC" is 1. 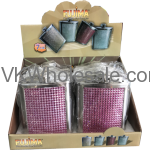 Minimum quantity for "Assorted Glitter Design Flask for Liquor Display 6oz 8PC" is 1. Minimum quantity for "Assorted Glitter Flasks for Liquor Display 6oz 8PC" is 1. 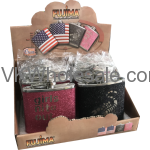 Minimum quantity for "Casino Printed Pocket Flask for Liquor Display 8oz 8PC" is 1.